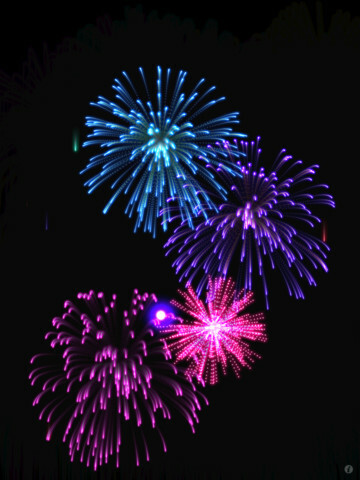 FREE today only and just in time for the 4th of July – Real Fireworks Artwork 4-in-1 HD. So how real are they? My dog is a believer. 🙂 He did not enjoy the realistic sounds (which can be disabled). The main features of this app are customizable (tail length, explosion size, particle size, gravity, color mode) fireworks, an interactive visualizer, a wallpaper maker, and a drawing pad. If the weather is not cooperating on the 4th, kids (and adults) will have fun creating their own indoor fireworks. If you have an Apple TV, you can connect it to your iPad 2 (or later) and watch fireworks on your TV. Classroom teachers could use this app to celebrate the class doing well on a test, earning class points for good behavior, etc. Fun stuff! !